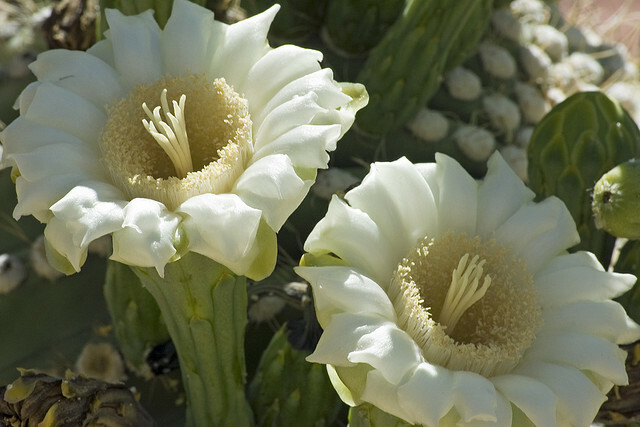 Although the saguaro is the state flower of Arizona it can be found in Mexico as well. 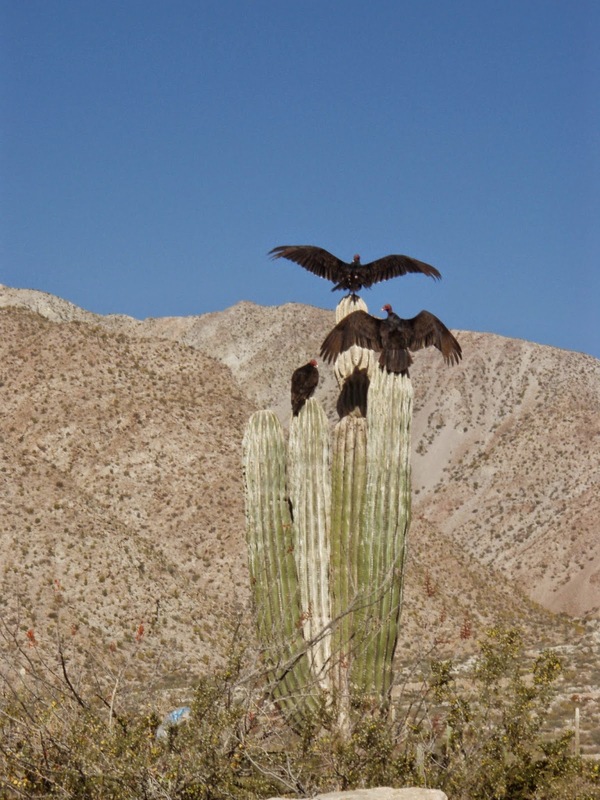 The name comes from a combination of Spanish and the local American Nation language of the Tohono O'odham. 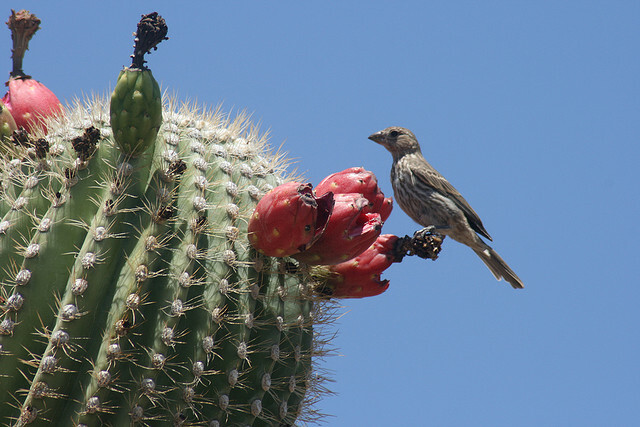 They traditionally harvested the red fruit of the saguaro (pronounced sah-wah-roh) – and it was an important source of food for them. 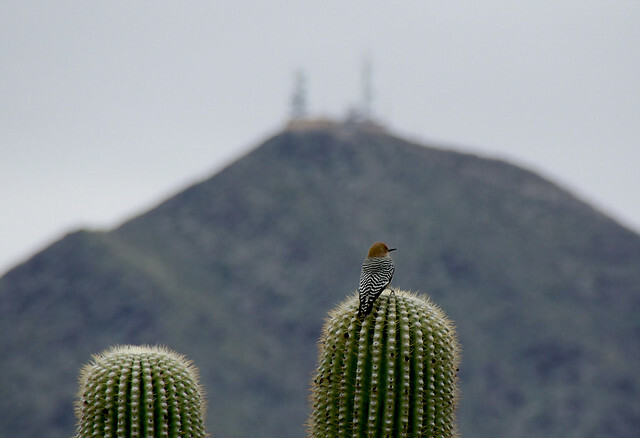 So it is too with the visitors to the cactus such as this gorgeous Red-shafted Flicker – a type of woodpecker who will not find much wood in this part of the world but will, nevertheless, make itself quite at home here. 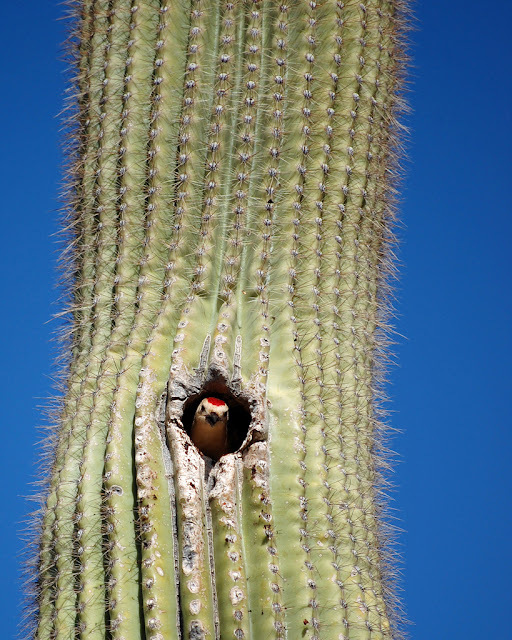 The amount of life that the saguaro attracts is quite amazing. 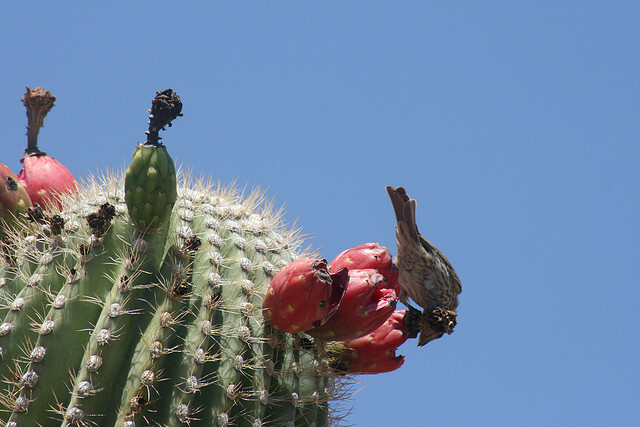 As well as the discovery of the unexpected – such as a woodpecker variety, you will even get to see hummingbirds in action as they hover over the enormous, candelabra-shaped cacti. 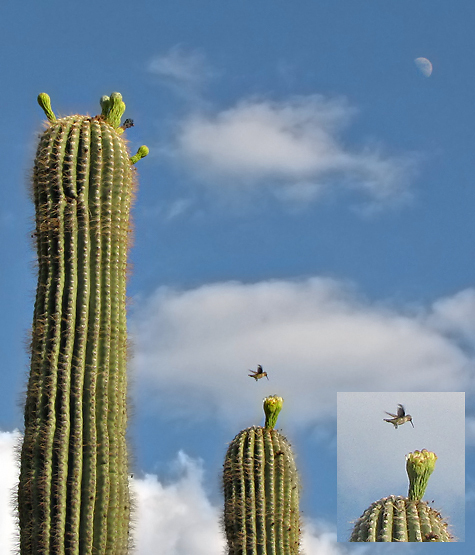 It was many generations of hummingbird ago that this example of the saguaro first started its slow reach for the sky. 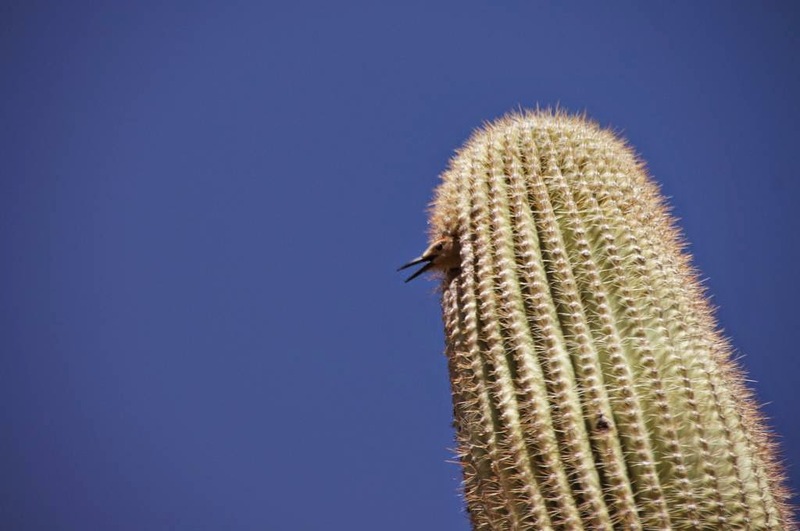 Although they will sometimes reach fifteen meters in height, the saguaro does not bloom until it is around fifty years old. 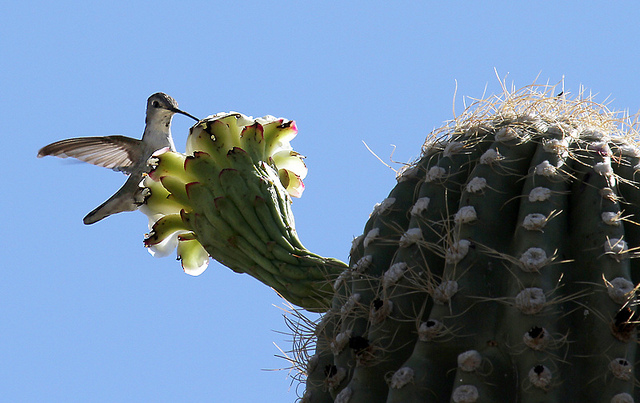 The hummingbird here can be weighed in grams while the saguaro itself may weigh up to nine thousand kilograms. That’s some difference. There will be a difference in life span too. 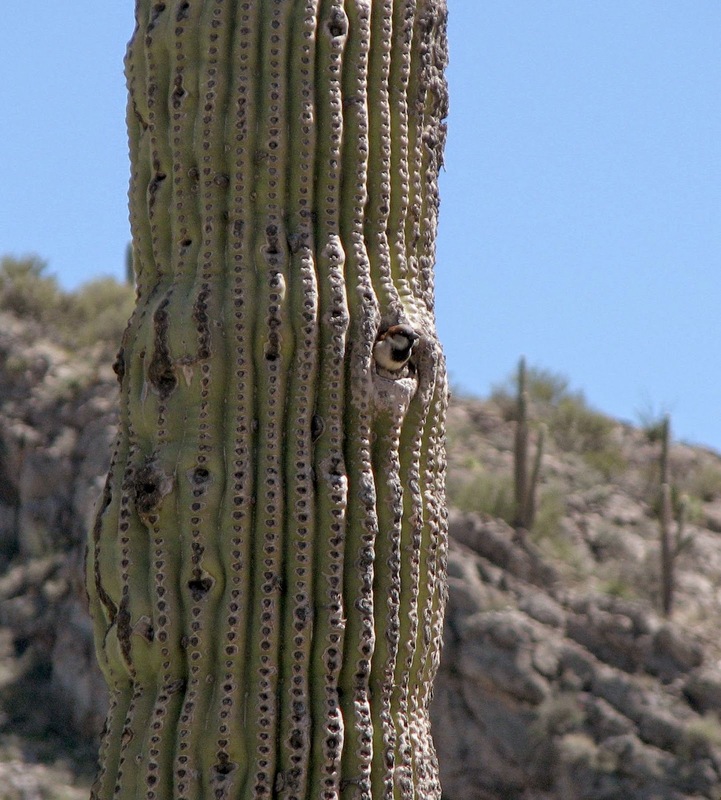 A saguaro may well live to two hundred years old. 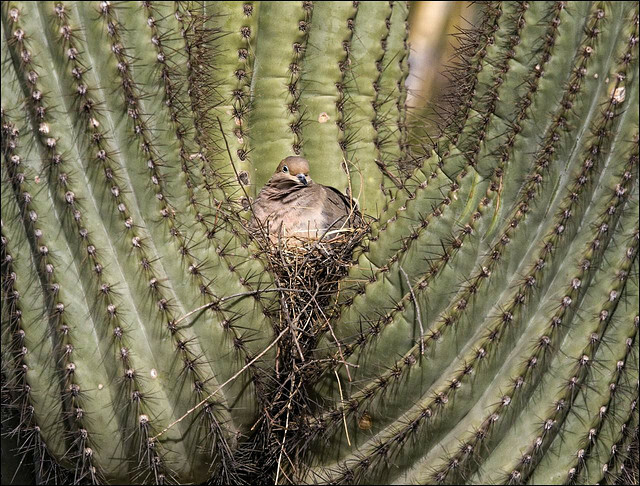 When the oldest saguaro first took root the Napoleonic Wars were happening and Abraham Lincoln was just about to be born. Even though this is a great age, their demise is only usually brought about either by being uprooted by the wind or by washouts. 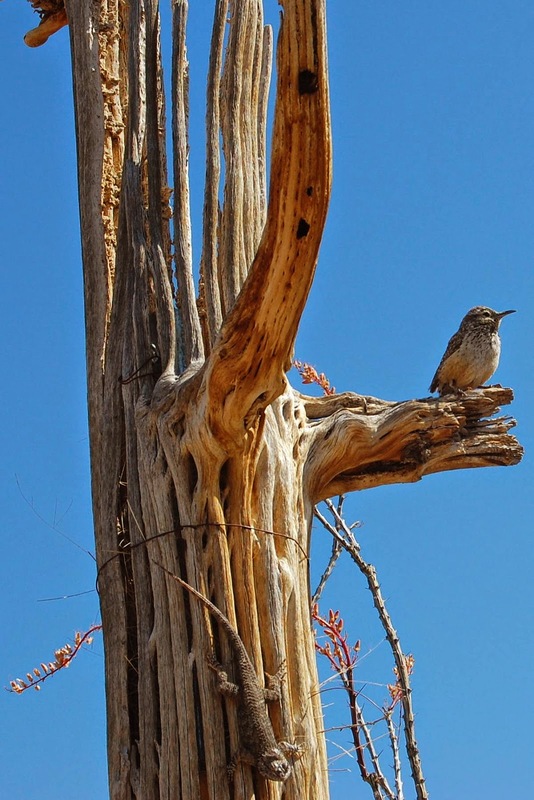 Even after their death, however, they still have a use – as the House Wren below has discovered. 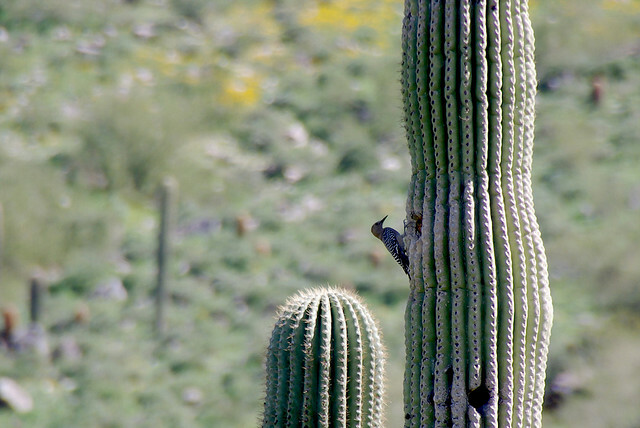 If you look carefully at the ‘trunk’ below it, you will notice another visitor – a lizard – well camouflaged against the dead saguaro. The party of house finches below, oblivious to the history of their temporary host, uses it as a handy vantage point to survey a small pond nearby. Perhaps they would be less confident about where they perched if they were to realize just how shallow the roots of the saguaro are. Not a lot to worry about at the moment, however – the roots are incredibly wide ranging and they gather moisture from a large area around the plant – plus of course supporting the growth above. Although the cactus can astonish us with its height and shape, it is perhaps surprising that the flowers are relatively small. 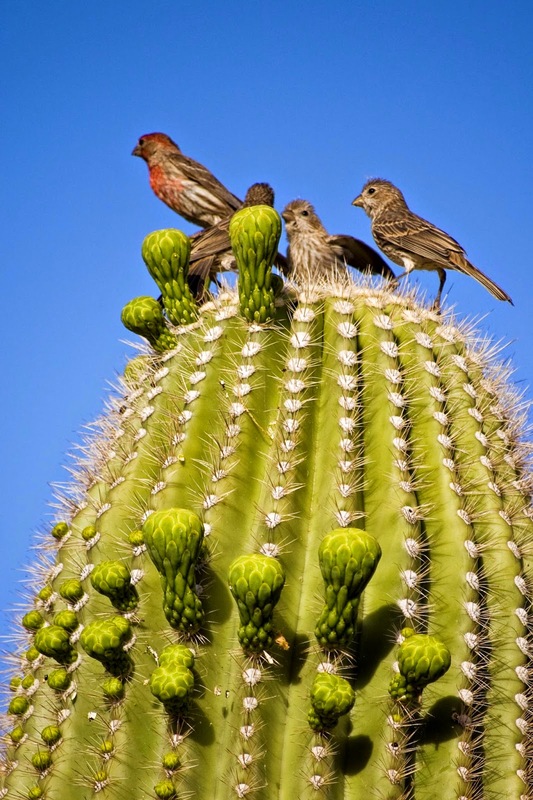 They are, however, perfectly formed, and attract a wide variety of insects eager to take the pollen that the cactus produces. 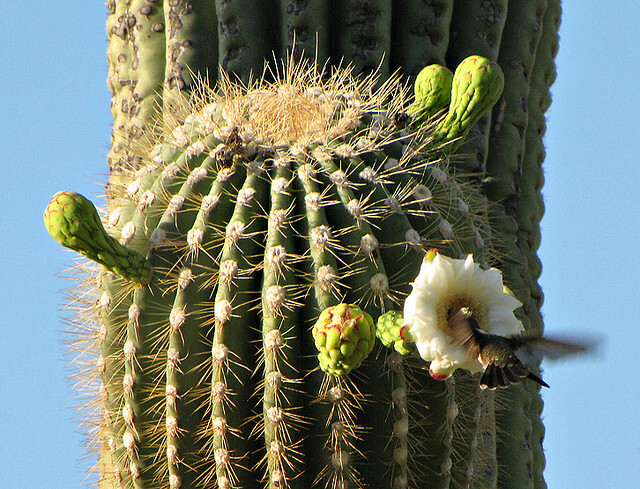 The flowers bloom at night and stay open the next day as well – so people often assume that the birds and the bees (as it were) are the main pollinators of the saguaro. 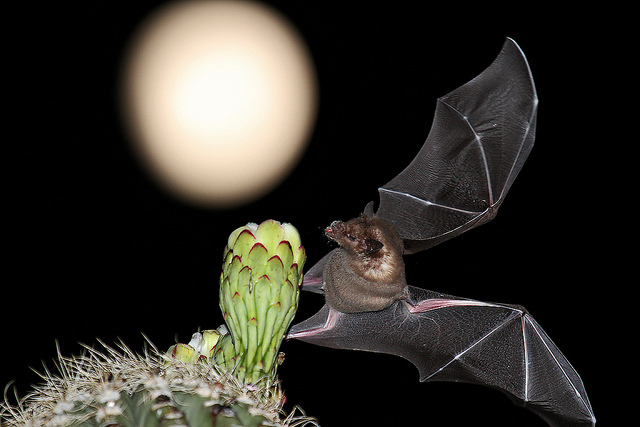 However, the major pollinator is the lesser long-nosed bats. They may not look like they are up to much, but the flowers of the saguaro produces a fruit that can hold up to two thousand seeds. 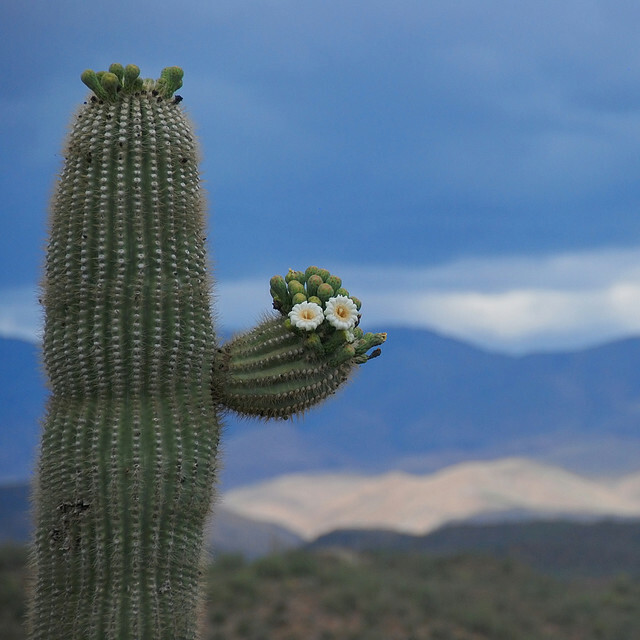 The cactus has formed a relationship with the local wildlife because its flowers are self-incompatible. That means that they cannot pollinate themselves and so require the assistance of a local mammal, bird or insect in order to reproduce. 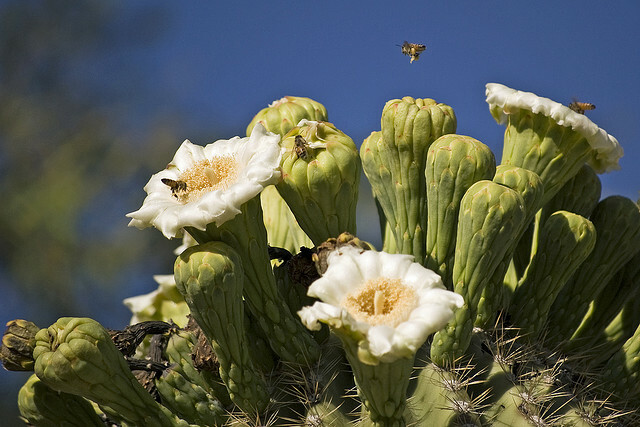 As large amounts of pollen are required to pollinate a few thousand seeds the cactus becomes a major wild life center when it is in bloom. 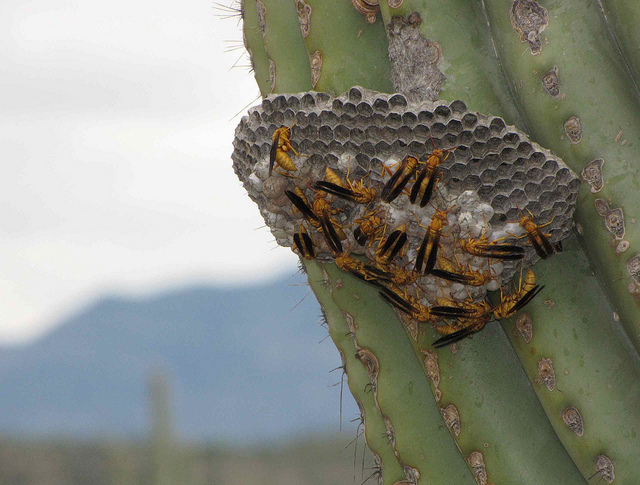 The paper wasp makes an unusual choice for the site of its nest on the side of the saguaro. When the fruit matures it becomes a reddish color and this attracts birds such as the House Wren to enjoy the feast. This forms an important part of its diet – though some species are less grateful. 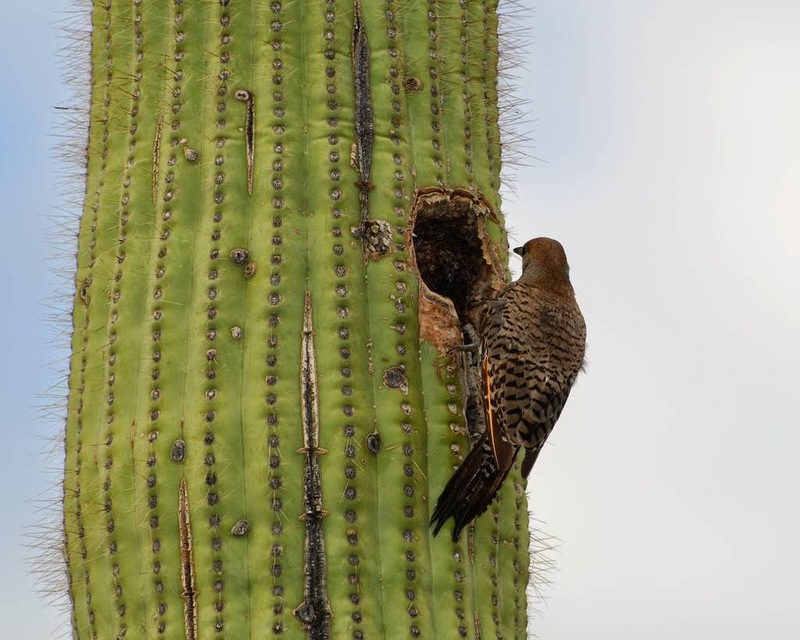 The Flicker seen above will sometimes create nest holes in the saguaro which is too large for the cactus to cope with and it has been noted that when built in the wrong place these nest holes can kill the plant – especially as they create a new hole each season. Any bird of a certain size has to be quite careful about how it makes its landing – as this White Winged Dove is discovering. Once safely perched, however, one can assume a certain safety and even invite a friend over for an afternoon of preening. 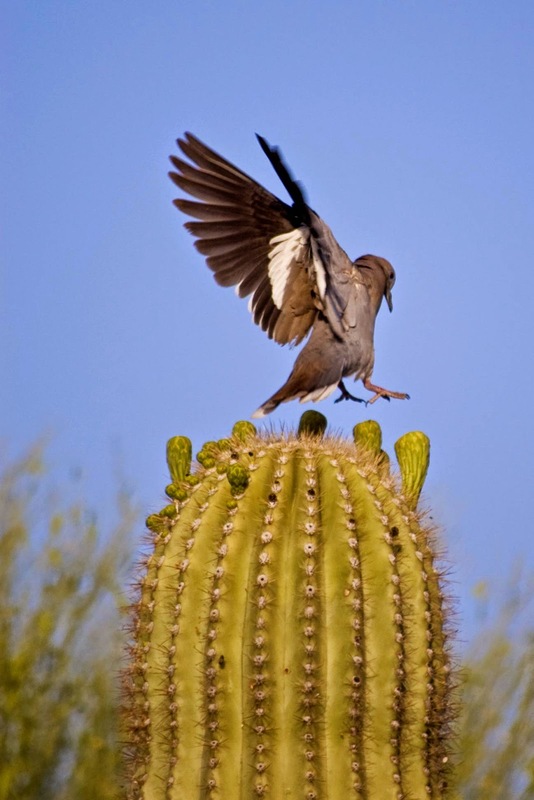 It isn’t just the more unusual birds that are attracted to the saguaro – even the humble house sparrow has been know to get in on the act. 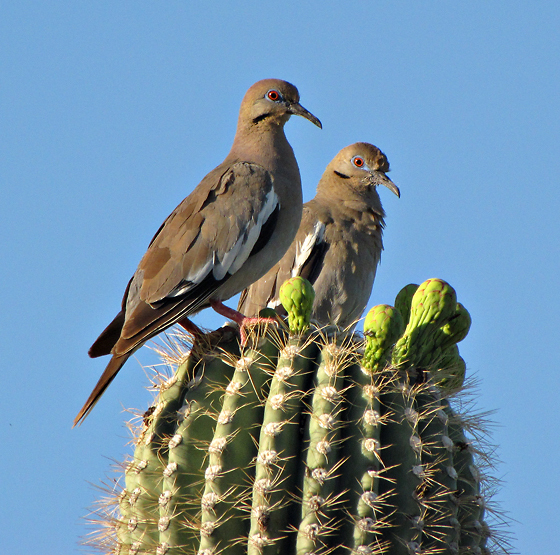 This one – a male because of the black bib below his beak – looks quite at home in the desert of Arizona. Yet it is often the more unusual visitor, such as the hummingbird below, which really enthralls the watcher. 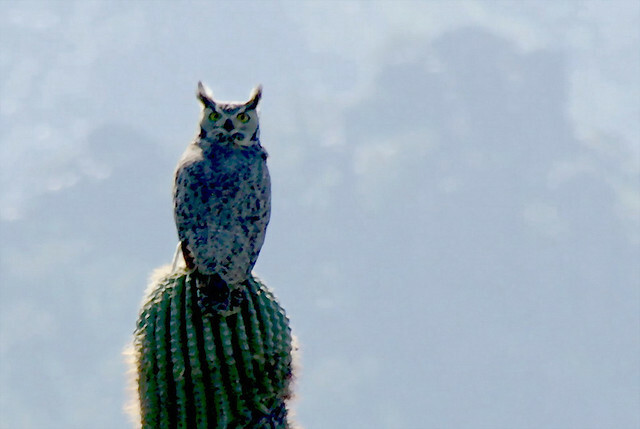 The Great Horned Owl and Red-tailed Hawk are also visitors, but it is not the saguaros that attracts them as such, rather those animals which are drawn to the cactus for their own nourishment. 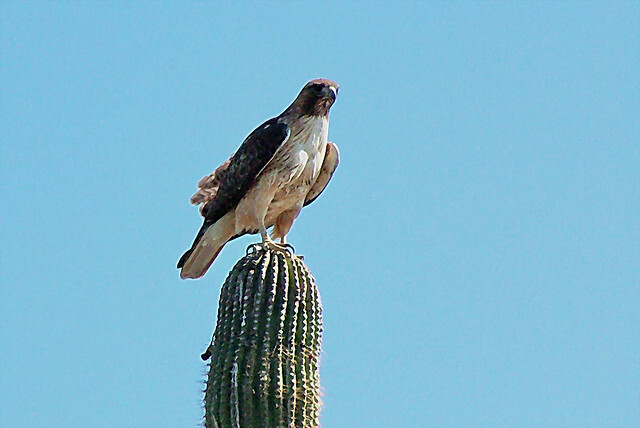 Although the saguaro is a source of food for many animals, there is of course one or two who know better than to try it. It can only be hoped however, that this wonderful and unique ecosystem can survive. 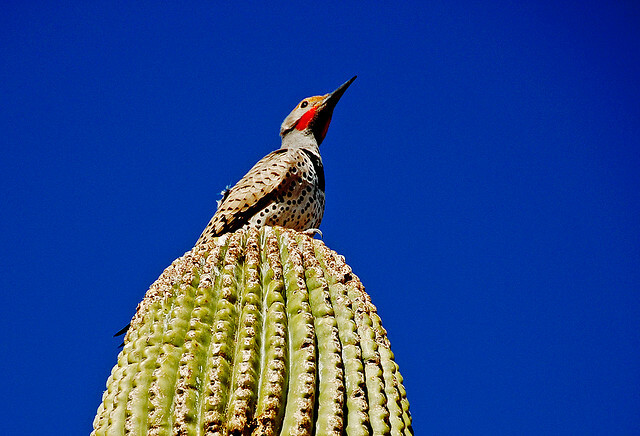 Yet even if you don't derive any sustenance whatsoever from the saguaro itself it makes a remarkably good perch upon which to warm up in the morning sun.